We are a third generation family farm run by the Thompson family at Brook Farm at Great Oakley in North Essex. Founded in 1948, we have gradually expanded over the last 70 years and are now market leaders in specialist products for the wholesale markets and food service sector. Our fields and orchards at Brook Farm near Harwich straddle the ridge that runs down the north eastern tip of Essex. We enjoy a maritime climate perfect for growing with the Stour Estuary to the north, the marshes and backwaters of Hamford Water to the south and the North Sea to the East. The combination of light and the mild climate make give us the ideal conditions for fruit growing. George Thompson and his fleet of vehicles in the early 1950s. George Thompson (right) in 1954). George Thompson, grandfather of Pete who runs the farm today, worked in agriculture all his life moving from Suffolk to Essex after the Second World War. In 1948 he bought Wash Farm, as it was called then, after the old wash pond used for swelling cart wheels. He was persuaded by his wife to change the name to Brook Farm as she thought it would remind people of clothes washing! George was also a wholesaler, growing and selling fruit and vegetables to London markets. Over the years George’s son, Michael, expanded the farm buying up land as it became available and growing large quantities of vegetables for London’s wholesale markets and local customers. 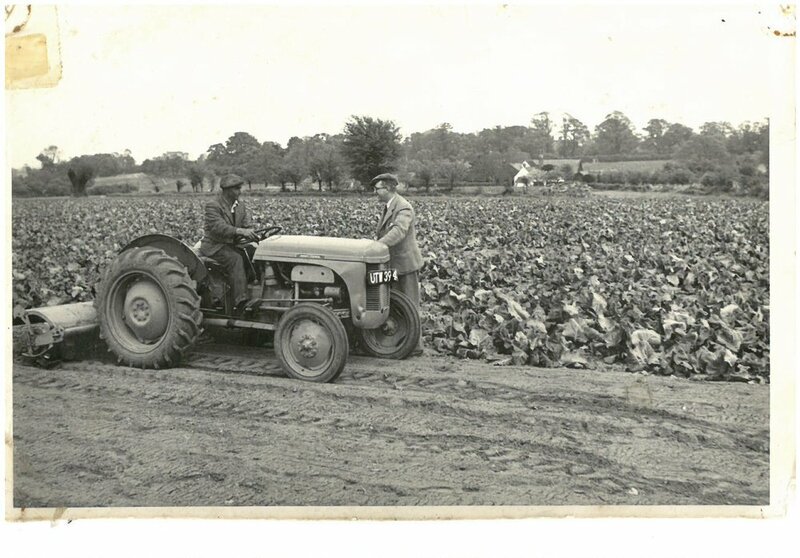 In the 1980s we grew lots of lettuce, but as the supermarkets took hold, we weren’t big enough to keep up with their demand and weren’t able to acquire more land quickly enough so got left behind. As the big growers flooded the market with produce at less than market price we began to specialise. Our greens and onions were being bought from markets by the Chinese food service sector and we’ve grown alongside demand for these products. Today we farm about 400 acres, working with neighbouring farmers to allow rotations. 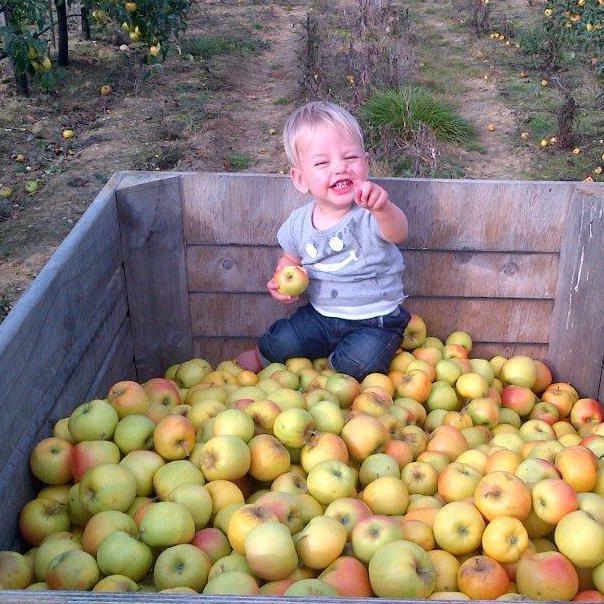 The farm is run by George’s grandson and MD Pete Thompson, who lives here with his young boys. Chairman Michael Thompson; Non-exec Will Sibley and Production Director Patrick Wooding and other family board members help oversee a diverse and dynamic young team led by Farm Manager, Kim Allen. Employing 25 regular staff the team is bolstered in summer months by seasonal staff from home and abroad to help meet seasonal peaks of production. Old Tythe maps of show our area was rich in orchards and for centuries the Tendring Peninsula was famous for growing pears. These fruit growing traditions had all but died out until we began trial crops of apples and pears in the small fields around our village in 2009. Today we have 15 acres of orchards and grow apples, pears, apricots and more recently now figs and citrus using a mix of modern and traditional plantings. The farm has gradually expanded over 70 years in and around the village of Great Oakley. Public access is allowed around much of the farm for those in the village to walk and ride horses and bikes. We have always worked to create new wildlife habitats, plant trees and hedgerows and in recent decades gradually moved to a lower input system for the benefit of the environment.